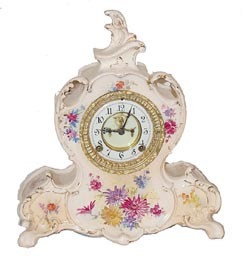 Ansonia Clock Co. "La Vendee", ca 1904. A spectacular Royal Bonn porcelain case, molded and fired leaving perforations and a flame top. The clock is so large and different that Tran Du Ly devoted one whole page to this clock in his Ansonia Clock book. There are several places it could have easily been chipped or cracked, but it has escaped any damage for 100 years. It is 8 day, half hour strike. 2 piece porcelain dial and open escapement. Very nice beveled glass, movement is sound, clean, and running. Case is cream colored with purple, red, yellow flowers. Ly-Ansonia, page 638.